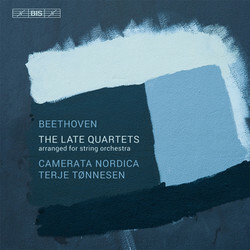 Like few other works, Beethoven's late string quartets have gained an almost undisputed standing as the very apex of their genre. Not many of Beethoven's contemporaries would have accorded them this: the composer Louis Spohr called them 'indecipherable, uncorrected horrors' and the quartets were widely regarded as the monstrous products of a madness which at best could be excused by the composer’s deafness. One of the first to recognize them for the masterpieces that they are was Franz Schubert, who after having heard a performance of Quartet No.14 in C sharp minor is reported to have said 'After this, what is left for us to write?' Composers after Schubert have been as awestruck by this music, with Stravinsky famously describing the Große Fuge as 'an absolutely contemporary piece of music that will be contemporary forever.' The feeling that Beethoven in these works was giving form to a universal music which transcends genre conventions have also inspired many to adapt various of the quartets for larger forces, including the conductors Dmitri Mitropoulos and Arturo Toscanini. On the present recordings, originally released by the Altara label in 2006, it is the Norwegian violinist Terje Tønnesen’s adaptations we hear, performed by himself and his Swedish string ensemble Camerata Nordica. Besides providing the greater dynamic spectrum that a larger ensemble can bring to the music, Tønnesen’s main aim has been to strengthen the contrasts between intimate passages and fuller textures by employing solo players in certain passages, as in a concerto grosso. He and Camerata Nordica has also reinstated the Große Fuge in its proper context: that amazing 15 minute monolith was originally intended as the finale of Op.130, but proved indigestible to contemporary audiences and critics – one of whom described it as ‘as incomprehensible as Chinese’ – and was replaced by an easy-going rondo following a request from Beethoven’s publisher.